Brian Landau, senior vice president and automotive business leader at TransUnion, again used a single word to summarize the latest quarterly auto finance information he and his team assembled. Landau decided the first-quarter moniker should be stabilization. 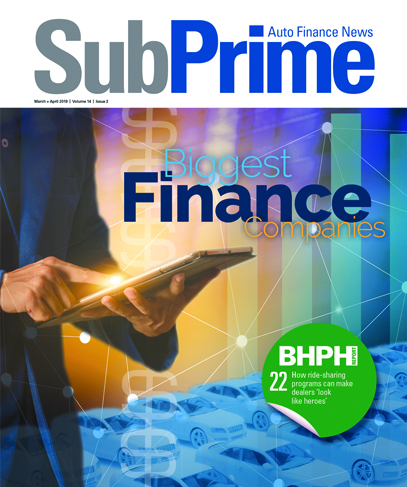 Landau explained his thinking to SubPrime Auto Finance News as TransUnion released its Q1 Industry Insights Report that showed performance of non-prime vintages helped to construct his assessment. “Just looking the data, this was a quarter of stabilization. That’s how I would define it for a number of different reasons,” Landau began. “One is we’re kind of trending like how we’ve done in previous quarters as originations are still in decline year-over-year, but the rate of decline is starting to slow down a little bit. I think we’re reaching a point of stabilization with regard to that,” he continued. “Another key point is around delinquencies, which are rising but rising at a much slower rate. It’s a much different message now than what it was in 2016. There was a hike from 2016 to 2017 but just a marginal increase from 2017 to 2018,” Landau said. “More recent vintages in the non-prime space are starting to show some marginal improvement relative to prior vintages with delinquencies growing in a less accelerated manner,” he added. “All of those signs are pointing to stabilization in the market right now,” Landau went on to say. TransUnion’s Industry Insights Report showed that tighter underwriting and improvements in the oil states appear to be positively impacting serious auto finance delinquency rates per borrowers who are 60 days or more past due. After growing from 1.16 percent in Q1 2016 to 1.30 percent in Q1 2017, TransUnion determined the serious delinquency rate stayed relatively flat at 1.32 percent in Q1 2018. Analysts noticed the top six states with the largest annual decreases in delinquency rates in Q1 2018 — Alaska, Wyoming, Texas, New Mexico, Oklahoma and North Dakota — are among the eight states where oil, gas and mining account for 10 percent or more of gross domestic product. TransUnion added the other two states — Louisiana and West Virginia — also performed better than the national average in terms of annual changes in 60-plus days past due rates for Q1 2018. When asked to explain what the trends in those states mean, Landau said, “This is another case of anomalies regressing back to the average. I would say the same thing when we had the financial crisis. There were certain states like Arizona, Nevada and Florida that were heavily impacted by the mortgage crisis. Then you saw them rebound pretty well. I see this as a similar trend. While total auto balances rose 5.2 percent to $1.183 trillion, TransUnion indicated this figure marked the lowest annual growth rate since Q1 2012, which at the time was 4.2 percent and on the rise. TransUnion also observed continued shifting in the origination makeup of auto finance holders, which continues to migrate to higher credit tiers. Analyst added overall originations, viewed one quarter in arrears to account for reporting lag, declined 1.5 percent in Q4 2017. This marked the sixth consecutive quarter of yearly declines, though the smallest such decrease was in 2017. With that kind of streak in place, Landau responded to the thought of whether the industry could ever see the significant growth the auto-finance space enjoyed coming out of the recession. “You had a little bit of the perfect storm there,” he said. “You had pent-up demand for new vehicles driven by the fact consumers were delaying their purchases during and shortly after the financial crisis we had. In addition to that, you had below average fuel prices and inexpensive credit fueling demand for more expensive vehicles. In a sense, that helped to promote more financing than in the past. “To see that kind of growth doesn’t happen too often,” Landau continued. “It may not repeat any time soon, but I would say the market is resilient, and people will still need vehicles to get to and from work, to other places of importance. And vehicles aren’t getting any cheaper, so there will always be the need for financing. *Note: Originations are viewed one quarter in arrears to account for reporting lag. TransUnion also offered a trove of information about consumers using their credit cards. With more than 416 million credit cards and nearly 175 million consumers with access to them, analysts indicated credit card usage continued its upward trajectory in Q1, according to the latest TransUnion Industry Insights Report, powered by Prama analytics. TransUnion’s report found that serious credit card delinquency rates per borrower (90 or more days past due) increased in Q1 2018 to 1.78 percent, up from 1.69 percent in Q1 2017. The delinquency rate is now level with the 1.77 percent mark observed six years prior in Q1 2012, though it remains below the 10-year first quarter average of 1.91 percent. Analysts indicated the average card debt per borrower also followed a similar path as delinquencies during the last year, rising 2.63 percent to $5,472 in Q1 2018 from $5,332 in Q1 2017. “Though delinquency rates are certainly rising, there are several reasons we do not believe this is a worrisome trend at this juncture,” said Paul Siegfried, senior vice president and credit card business leader at TransUnion. “First, credit card issuers have been relatively conservative over the last five quarters, issuing more credit to lower-risk consumers compared to higher-risk consumers. Second, the credit limits they are extending to consumers in most risk tiers are generally lower than those they had issued in prior years,” Siegfried continued. “Finally, we believe it’s a positive sign for the economy that more consumers have access to credit and that delinquency rates, while growing, are doing so at a slow pace and remain below levels observed immediately post-recession,” he went on to say.